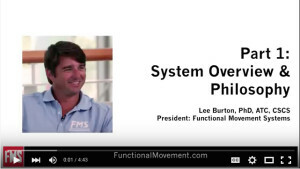 Functional Movement Systems aims to get people moving better and more often. At Highlands Osteopathy, we specialise in the use of the Functional Movement Systems tools. All 4 tools evaluate movement but have clear markers for when each tool should be used. The following image shows the hierarchy of where and when each tool is used. As you can see from the image above, the most important marker is pain. When someone is NOT in pain, we use the Functional Movement Screen to assessment quality in fundamental movement patterns. 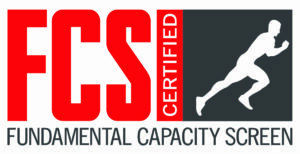 When all movements are functional and non-painful, we move on to tests of basic performance using the Fundamental Capacity Screen (FCS), Y-Balance Test and other basic performance measures including strength, agility, work capacity etc. 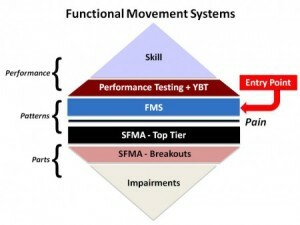 If a movement is painful, an SFMA review is required. Rod is currently the only Osteopath in Australia who instructs both locally and internationally for Functional Movement Systems. Saskia is a fully certified provider of both the FMS and SFMA systems. The movement patterns used in the test are designed to deliberately place an individual into a more difficult position during these tests so that weaknesses and imbalances become noticeable if appropriate mobility is not available and/or adequate motor control is not utilised. The FMS uses a series of corrective exercises directed towards non functional, non painful movement patterns to re-establish adequate mobility and motor control to address underlying movement dysfunctions. The FMS is best used as a pre-activity/exercise screen. Both Rod and Saskia are certified providers of the Functional Movement Screen. 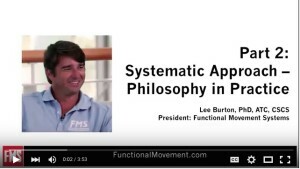 You can learn more about the specifics of the Functional Movement Screen from one of the founders – Lee Burton, by clicking on the picture below . The SFMA is used in a clinical setting for patients in pain and is specifically used by therapists. 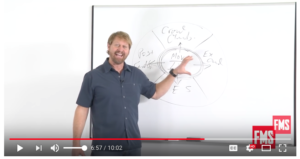 Its a comprehensive movement pattern based diagnostic tool to help us get to the source of your problem rather than just treating the symptoms. Think of symptoms as the “victims” and your primary dysfunctions as the “villains”. In any crime, the victims cry for help – just like your painful symptoms but the villains, the real cause of the problem, are silent and try to hide. The SFMA helps us find the villain’s hideout. The SFMA is the primary movement diagnostic tool that we use at Highlands Osteopathy. The SFMA helps us find the area of primary dysfunction. We then determine if the problem is a mobility issue or a stability motor control issue. For mobility problems we use our Osteopathic assessment and treatment tools to address the areas identified by the SFMA. When the problem is a stability motor control issue, we use the SFMA corrective rehabilitation exercises (based on neuro-developmental pathways) to directly address these problematic areas. This is incredibly empowering for patients because it helps put you in charge of your own therapy rather than a constant reliance on Osteopathic (or really any other) treatment. Both Rod and Saskia are certified practitioners of the Selective Functional Movement Assessment and experts in the use of the SFMA corrective exercises. The Y Balance Test identifies right to left asymmetries in both the upper body and lower body. This test allows us to quarter the body and look at how the core and each extremity function under bodyweight loads. The Y Balance Test Protocol was developed through years of research in injury prevention and identification of motor control changes that occur after injury. This device and protocol are highly accurate and can be used for measuring pre and post rehabilitation performance, improvement after performance enhancement programs, dynamic balance for fitness programs, and return to sport readiness. The test is best used once a person has adequate mobility and stability as cleared by the FMS. It can be used prior to or as part of general performance testing. This test is most important for anyone engaging in any athletic activity for long term injury prevention. Rod is a certified provider of the Y Balance Test. As we develop sports specific skills, we develop athletic capacity to underpin these skills. However there are athletic capacities that aren’t sports specific. They are fundamental energy capacities developed by all humans and underpin sports specific skill. This screen is not designed to predict success but rather find points of potential failure. The biggest, strongest and most athletically gifted are often not the best performers. It’s also true that an individual with greater sports specific skill will often lose if they don’t meet the minimum athletic standards required to compete. Do you have the athletic baseline to compete at your best? Get screened and find out. For more information about Functional Movement Systems, click here to go to their website or click the videos below.